As the election race draws nearer and nearer to voting day, many people have been wondering: What will the first debate be about? The first official presidential debate between Hillary Clinton and Donald Trump will take place on Monday, Sept. 26 at Hofstra University in New York. It will be moderated by NBC's Nightly News anchor Lester Holt. Luckily, for those of us sweating in anticipation (and horror) over what this first debate will involve, the debate topics were officially announced, and they are as vague as they are grandiose. 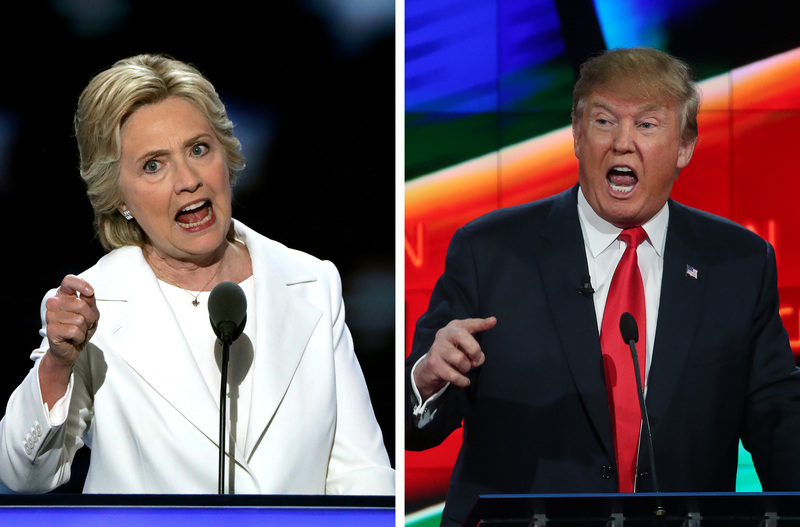 The announcement revealed that the three topics chosen for Clinton and Trump's first debate are: "America's Direction," "Securing America," and "Achieve Prosperity." The first debate is structured into six short segments, with two segments dedicated to each of the three topics, according to the Commission on Presidential Debates. While, obviously "America's Direction" can be interpreted a variety of ways, it's reasonable to expect that given Trump's campaign slogan "Make America Great Again," the prompt will lead him to explain the ways in which he intends to return America to greatness. In the past, that aim of Trump has manifested in the candidate calling for a ban on Muslims entering the United States (which he has walked back on and varied to certain degrees) and building a massive, magical wall along the Mexican border, which our neighbor to the south will pay for in its entirety. Conversely, I imagine Clinton's take on "America's Direction" would offer more inclusive proposals. As detailed in Clinton's speech at the Democratic National Convention in July, Clinton's presidential plans include creating a path for citizenship for undocumented immigrants currently residing in the United States. The prompt "Securing America" is a large topic that hints at themes of safety and who should be kept safe. It's hard to think the recent bombings in New York and New Jersey won't be of focus in this section of the debate. Both candidates have already weighed in on them. Trump said, “These attacks and many others were made possible because of our extremely open immigration system, which fails to properly vet and screen the individuals or families coming into our country.” In turn, Clinton slammed Trump's rhetoric as anti-Islamic and, ultimately, helping ISIS, saying "We're going after the bad guys and we're going to get them. But we're not going to go after an entire religion and give ISIS exactly what it's wanting in order for them to enhance their positions. Secondly, we know that Donald Trump's comments have been used online for recruitment of terrorists." The prompt "Achieve Prosperity" is rightfully at the core of many Americans' concerns. But what will Clinton and Trump likely showcase during this part of the debate? During a speech on Sept. 15 to the Economic Club of New York, Trump claimed he will create 25 million jobs through lowered taxes and his trade policies. He will likely reiterate these plans during the debate, but Clinton may have the upper hand in this area. Despite the fact that Trump is famous for being a businessman, a survey in August, which polled more than 400 experts from the National Association for Business Economics, revealed that many economists believe Clinton's plan are more beneficial to the economy. That plan plan that includes funding social programs by placing higher taxes on corporations. While these three prompts will provide plenty of room for a variety of topics during the debate, one thing is for certain — it won't be boring.